"Sampath Speaking" - the thoughts of an Insurer from Thiruvallikkeni: Ajit Wadekar is no more ! 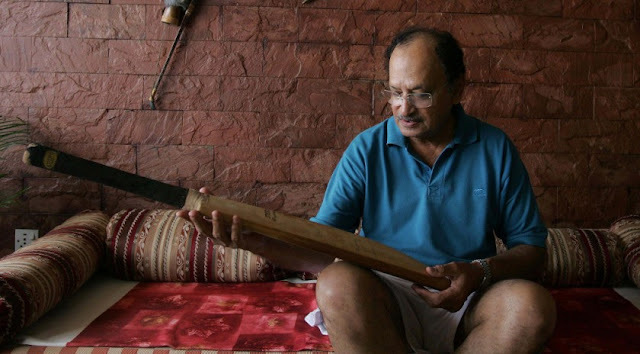 Ajit Wadekar is no more ! ~ have heard him to be an exceptional good Captain – whose career was curtailed due to one bad performance overseas !! Later he was to become a Coach – far off those days, when there were only Managers who would primarily take care of travel, ticketing, PR and less. Wadekar's tenure marked the decisive shift from ad hoc team managers running Indian teams on a tour-wise basis to having a full-time coach who had a longer tenure. Over his four-year tenure, Wadekar forged a strong working relationship with captain Mohammad Azharuddin, and India dominated at home for the best part of this period. For 14 Tests between 1992 and 1994, India were unbeaten, including a 3-0 whitewash of a strong touring England side. Hero Cup was won when he was at the helm. Surprisingly for those days, he played in 2 One dayers too – both of which India lost in England in that disastrous tour in 1974. You will be surprised to know in that ODI at Leeds on Jul 13, 1974 – 12 Indians made their debut. India made a good 265 yet lost – Wadekar scored 67 and was overshadowed by Brijesh Patel’s 82. The debutants were : Sunil Gavaskar, Sudhir Naik, Ajit Wadekar, Gundappa Viswanath, Farokh Engineer, Brijesh Patel, Eknath solkar, Abid Ali, S Madanlal, Srinivasan Venkatraghavan and Bishan Bedi – 11 yes, who was that 12th Indian making debut ?? Ajit Wadekar, who made 2113 test runs and who led India to historic series wins in the West Indies and England in 1971, has died at the age of 77 on 15th Aug 2018. He had been suffering from a prolonged illness. Ajit was an aggressive left-hand batsman and an excellent catcher in the slips, played 37 Tests, scoring 2113 runs at an average of 31.07. His one century, a match-winning 143 at Wellington, came during India's 1967-68 tour of New Zealand, where they won a series away from home for the very first time. During his tenure India grew to a genuine force in World of Cricket. When Pataudi sat out the tour of the West Indies in 1970-71, Ajit took over the captaincy, thanks to the casting vote of Vijay Merchant, the chairman of selectors. Fuelled by the batting exploits of Dilip Sardesai and the debutant Sunil Gavaskar, India would go on to clinch a 1-0 victory over Sir Garfield Sobers' side. When they followed that up with another 1-0 win in England, inspired by BS Chandrasekhar's 6 for 38 at The Oval, many considered India unofficial world champions. Indian team has many a times been let down by its poor fielding, more so poor catching. The career of TA Sekar was marred by those dropped catches on his debut at Pak. Ajit strategically picked Solkar, Abid Ali and Venkat. Add Engineer and himself, this perhaps represented the best close-in cordon that could pluck catches from vicious spinning deliveries of the quartet. Eknath Solkar did a great job standing very close at forward short leg. Sadly enough that tour of England in 1974 when Indians were bowled out for a paltry 42 hastened his career – and when WI Clive Lloyd toured India, Mansur ali Khan Pataudi was back at the helm. To those who remember the Q on 12th player making debut in that match. It was Robin Jackman, who debuted for Surrey in 1966, could bowl fast, made ODI debut in 1974 and Test debut in 1981. Robin David Jackman was born in Simla in 1945, had close ties with South Africa, coaching and representing Rhodesia ~ when he was chosen for the WI tour in 1980-81 representing England, the Guyanese Govt objected to his involvement with the apartheid Proteas and revoked his visa. The second test was thus cancelled as England did not heed to the pressure.